The Rake has collaborated with Rubinacci to create a unique and exclusive two-piece suit, consisting of a double-breasted jacket with matching Manny trousers in a grey houndstooth. Rubinacci marries the finest aspects of British and Italian tailoring, exemplified here with the two, deep forward-facing pleats on the Manny trouser. Photo by Shaun Darwood. A some of you will know, The Rake is celebrating its 10th anniversary next month and, taking into consideration the turbulent times that the publishing industry has been subjected to in recent years, we are utmost proud of the milestone. During the last 10 years, we have evolved significantly and are now, as well as being a magazine, a fully-fledged, finely-curated e-commerce store. Throughout this journey, one brand has been particularly omnipresent, occupying more product categories than any other on the shop. That brand is Rubinacci, Naples’ foremost bespoke tailor and ready-to-wear depository. Our admiration for the house is no secret. After all, Rubinacci, which is steered by Mariano and his son, Luca, effortlessly blends the finest aspects of British and Italian tailoring, using expertly-chosen colours, textures, flattering cuts and a broad range of styles. They are a pleasure to work with and a pleasure to support. The Rake now travels to Italy at least four times a year: twice for Pitti Uomo and twice to Naples, to visit our long list of Neapolitan partners. A small team has just returned from a week-long stay, myself included. I’ve fallen slightly in love with it; the cuisine is mind-blowing — a humble, nondescript tiramisu honestly sent me into a state of euphoria — and its age-old architecture is juxtaposed against run-down, graffiti-clad buildings. The most important facet, though, is that Naples has the highest concentration of bespoke artisans in the world. Fact. In February this year, as the rain splattered down outside of the Rubinacci HQ on Via Chaia — it takes up one facade of Palazzo Cellammare, a 16th century palace once occupied by Carravagio and a succession of aristocrats — we threw ideas back and forth with the lovely Marcella Rubinacci. We’ve worked on exclusives with Rubinacci before, such as Casentino overcoats, pocket squares, sports jackets and Marphyloafers, but interestingly not a suit. Fuelled and energised with espresso, we decided to work on a double-breasted jacket which was to be paired with Manny trousers, which are otherwise known as Gurkha trousers. Marcella briefly left our conversation and returned with a few bolts of cloth from the house's world-renowned vault. We landed on a small grey/black houndstooth in 95% wool with a slight bit of cashmere, to give the suit a more luxurious handle. Weighing at 300 grams, the houndstooth pattern itself originates from Scotland, like most popular patterns in men’s tailoring, underlining Rubinacci’s blend of Italian and British influences. The suit straddles both casual and smart dressing, too: the sombre palate adds a touch of formality, while the discreet pattern gives it a more casual air. As we all know, Rubinacci’s style is true to traditional Neapolitan tailoring. The style can be instantly recognised by the cloth bunching on the shoulder seams, known as a spalla a camicia or shirt shoulder. It gives one a greater range of motion due to the small surplus of cloth being inserted into the shoulder seam. It’s also aesthetically pleasing as it signifies highly skilled handwork. As such, the jacket will rest upon your blades like your favourite, well-worn shirt straight away. Keeping further true to the Neapolitan way, the shoulders are unstructured, as is the chest, and the jacket is fully lined for the cooler months. Elsewhere, there are two unfinished patch pockets and a barchetta breast pocket – another signifier of Neapolitan tailoring. 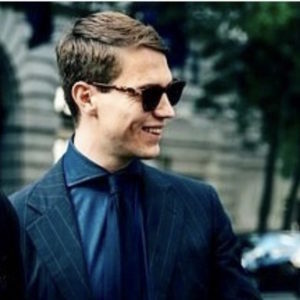 Compared to a single-breasted jacket, the double-breasted is more versatile, as it can be worn as a 6x2, alluding to a more formal British style, or as a 6x1, which has more flair to it thanks to an exaggerated, sweeping roll of the lapel, making it more Neapolitan. The lapels are peaked and finish wide with a flat, horizontal gauge. It is, without a doubt, a flattering cut that has visible handwork all over – most notably the button and lapel holes, the double backstitch along the line of the lapels and seams and, of course, the shoulders. The trousers are perhaps the hero piece of the suit, and thankfully Marcella was open to the idea of using the Manny style for the suit trousers. 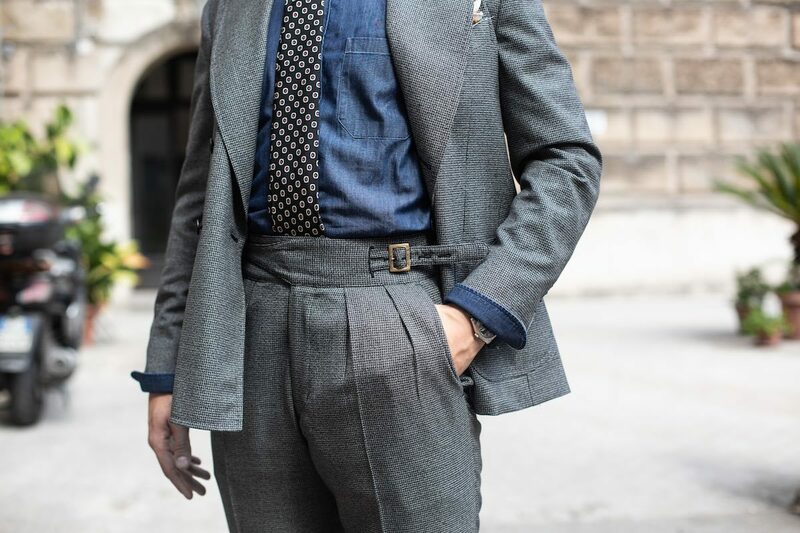 Rubinacci is pioneering the renaissance of the Gurkha-style trouser in the sartorial world today and the range of colours and cloths that are available is simply brilliant — you can browse the range here. They are emphatically cool, not to mention comfortable, which is care of the two-deep, forward facing pleats, which elongate the legs, heightened by the small houndstooth pattern. The cummerbund-style waistband is also particularly unique, and is fastened with two buckles on either side. The trousers are unfinished, so they can be taken to your local tailor where turn-ups can be easily made. We suggest downsizing with the trousers for a better fit. There aren’t any rules or guidelines for wearing a houndstooth suit, so treat it as a plain weave mid-grey. We’ve paired it here with a dark denim shirt, black circle motif silk tie and pocket square — all from Rubinacci, of course — which is certainly a casual look. The Rubinacci way is certainly one with an array of colour, but a monochrome look with a white shirt and black grenadine tie would also look elegant. 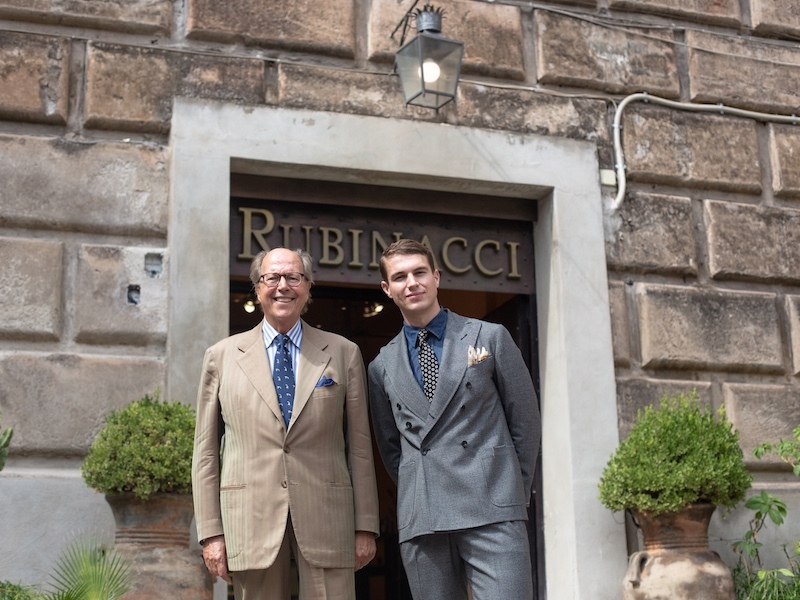 Our Associate Style Editor, Benedict Browne, with Mariano Rubinacci outside the Rubinacci HQ in the exclusive suit.